A paper presented at the conference Manuscripts and texts, languages and contexts. 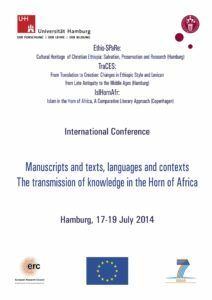 The transmission of knowledge in the Horn of Africa – University of Hamburg, 19 July 2014. Saho is an East Cushitic language spoken in Eritrea and in northern Ethiopia. Its closest sister language is ʿAfar. Most of the Eritrean Saho are Muslims, and Islamic hymns, called nazme, are sung in Saho by sheikhs and their followers during the mawlid and other religious ceremonies. They alternate with Arabic hymns read, e.g., from the booklet Mawlidu ’l-Nabī by Muḥammad ʿUṯmān al-Mīrġanī. They are generally associated with popular Sufi Islam and the Ḫatmīyya order. It is unknown when Saho nazme composing and singing began, because they are mostly remembered anonymously. As far as the present authors know, there are no printed collections of Saho nazme, but only occasional instances of sheikhs recording them in ajami Arabic script. One example of nazme will be discussed in the presentation. It was elicited by the authors in Irhaafalo (Eritrea) in 2010 from its author, Sheekh Soliiman Ismaacil Maxammad, who also provided a manuscript copy of it in ajami. Other examples of Saho literary texts written in ajami script and read by the Saho diaspora in the UK will also be discussed. See also the Other texts section.